Objects in AxCMS.net refer to all content objects used on pages. These can be texts, controls, images, flash movies, etc. 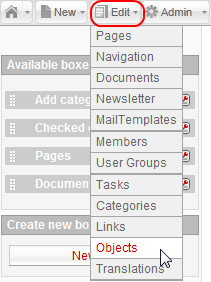 All objects in AxCMS.net are presented on the ObjectsOverview page as a list. 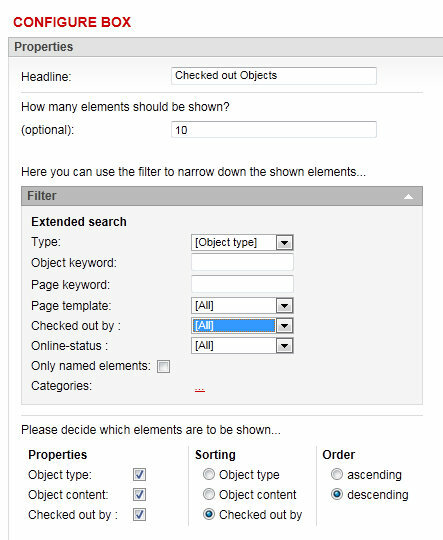 Advanced search tool with numerous filters such as 'object type' or 'checked out by'. By default the search shows results for the currently logged in CMS user. Select 'All' to get the complete list of all objects. With buttons Check in and Delete. You can select objects from the list and check them in or delete them from the page they are located on. Please note that objects related to physically existing files (such as images, for example) are only deleted from the page, the files themselves are not deleted. Tip: You can create a box for checked out objects on your CMS homepage in order to instantly find and edit those checked out objects. To create a box like this, click on New at the left tools section on your AxCMS.net homepage. Name the box, select your desired filters and save the box. Finally, drag the new box from the left tools section to the desired position within your cms homepage.